Can my family use EAP services? Yes. You and your immediate family members may use any of Continuum EAP’s services. Are there services available online? The Continuum EAP website contains an online orientation, training information, and details about our workplace and work/life services. Many of our EAP member companies choose to subscribe to Continuum's HelpNet. HelpNet is an interactive online resource center that contains articles, resource links, assessments, and skill-builder training modules to help members personally and professionally. 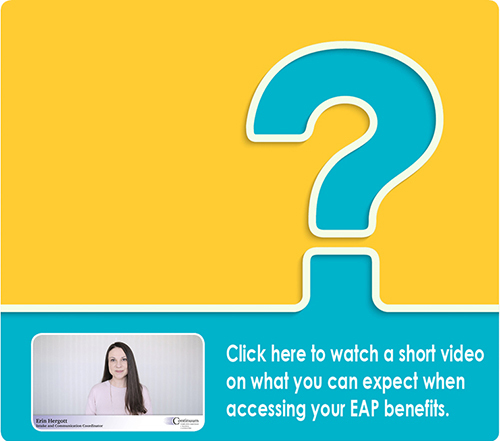 Do I have to talk to my supervisor or human resources department to get information about my EAP benefit? No. You do not have to notify your employer to use any Continuum EAP services. Simply call us at 1-800-755-7636 or 402-476-0186. You can also email us. In all cases, your contact with Continuum EAP is confidential. What happens when I contact Continuum EAP? When you contact us, you will be connected with an intake professional whose primary job is to understand your needs. We will first listen, and then we will ask you some questions so that we can connect you with the appropriate assistance. Does my employer know I'm calling? No. Your employer is provided only statistical information that shows the number or type of services used. They do not have access to the names of clients or the specific reasons for their calls. All of this information is kept confidential.